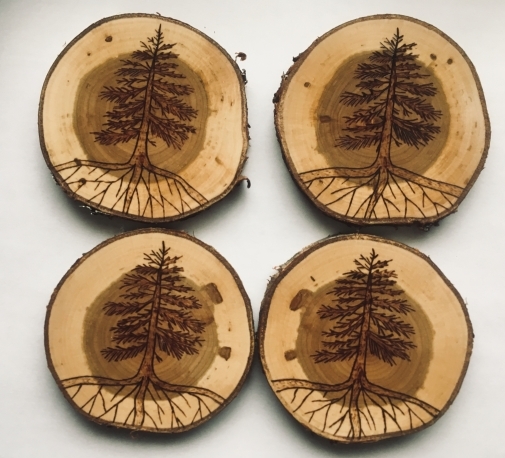 An awesome way to protect your table top surfaces with these pine tree set of four coasters. 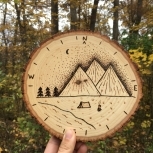 A great gift for yourself or nature lover/outdoorsy person! 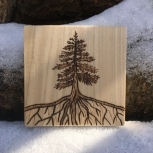 This listing includes four coasters with a handmade wood burned pine tree with roots design on each coaster. 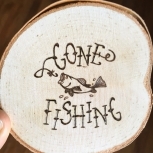 These coasters are on cherry wood. 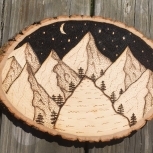 All wood is natural with their natural bark border that measure approximately 3 inches in length and about 1/8 of an inch thick. 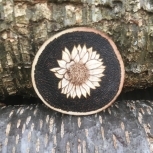 All four coasters are coated with three coats of polyurethane in order to protect the wood from hot and cold items so you can actually use them as coasters. Or you can just use them as decorations. Please note that even though the wood is protected with finish, the wood may still crack or develop stains. 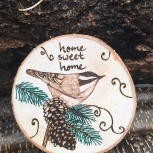 Please note that wood varies in shape, size, color, and may have knots that may not be displayed in the photos (although I try to avoid this).